Fees associated with filing patent applications in Italy as well as other patent fees are available in the fee calculator. If the 12-month term for filing the patent application in Italy is expired, the priority right may be restored within 2 additional months from the deadline. To obtain a filing date, it is necessary to provide the Italian Patent and Trademark Office with the name and address of the applicant, description of an invention in any language and document attesting payment of the filing fee. The official language of the Italian patent application is Italian. If the application is filed in a language other than Italian, a translation into Italian is to be filed with the Italian Patent Office within two months from the filing date. For confirmation of the right of priority, a certified copy of the priority application should be submitted within six months from filing the application or within 16 months from the date of earliest priority, whichever expires later. If the priority application is filed in a language other than Italian, a certified Italian translation is also required to be submitted along with it. The Italian patent application, which is not the first filing, does undergo the formal examination only. A first patent application filed in Italy (i.e. which does not claim priority) undergoes both formal and substantive examination. The European Patent Office conducts the substantive examination. No specific request should be filed or specific fee should be paid. The first annual fees are due starting from the 5th year as of the application date. Italian patent application may be filed within six months after the disclosure at an international exhibition or when such a disclosure was made in bad faith by any third party. The exhibition must fall within the terms of the 1928 Convention on international exhibitions. For foreigners residing outside Italy or the European Economic Area (EEA), it is recommended to perform the patent prosecution through an agent: a registered Italian patent attorney or a foreign lawyer provided that he has an address for service within the EEA. 1. Online Search databases: Italian Patents and Utility Models, European Patents (EPO). 2. 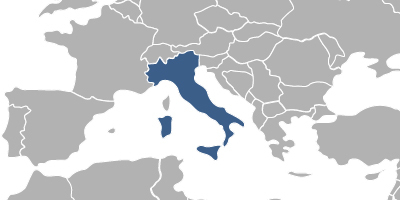 Patent registered in Italy via Paris Convention route is valid in San Marino and vice versa. 3. Italian PCT national phase entry is not possible. The PCT application in Italy may be nationalised via entering the European national phase and its further validation in Italy. 4. Inventions may also be protected as Utility Models in Italy, which are subject to formal examination only. Processes or chemical products are not protectable. The time frame for registration of utility model is approximately two years. Maximum protection period of a utility model in Italy is ten years from the date of filing. There is no limit to the number of independent/dependent claims that may be registered as Utility Model in Italy.